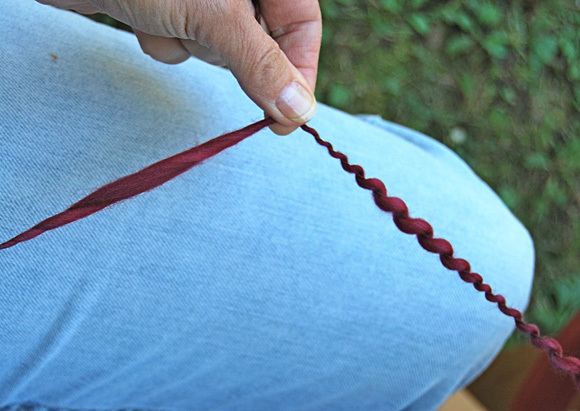 With art yarns all the rage, you may know how to spiral ply. If you’ve been spiraling your thick and thin yarns onto commercial laceweight, more than likely you haven’t run into many structural issues. 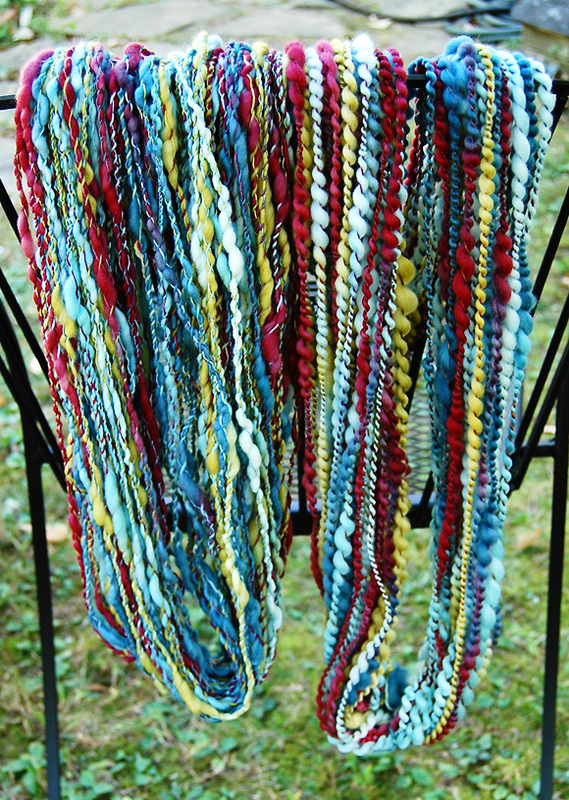 But if you’ve tried using your own handspun as a core (why? Cuz it looks so creamy good and feels even better!) you might have a few questions by now. 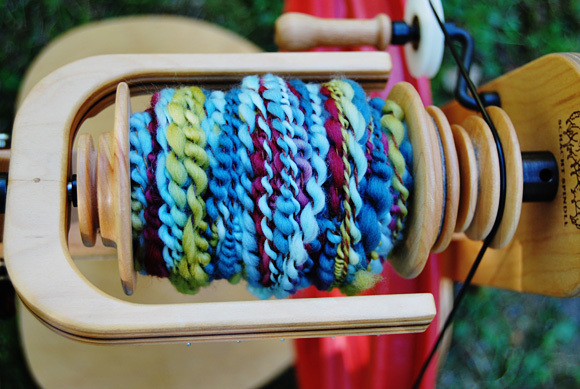 Like how to spin a truly balanced spiral plied yarn. Or how to spiral ply for a balanced bound boucle. There’s a difference. First off, definitions. 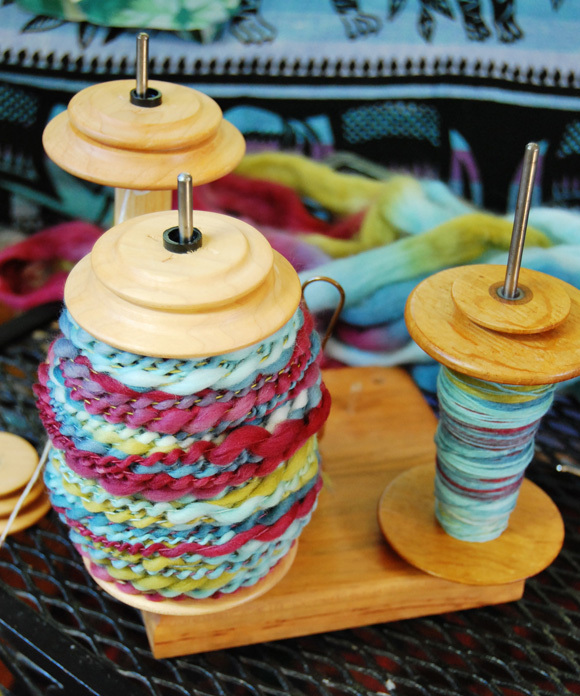 What makes a spiral ply yarn work? 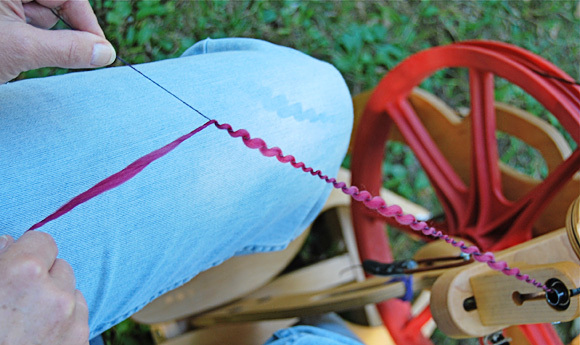 A normal two-ply yarn is made by holding two singles under equal amounts of tension, usually side by side at a very small angle, say 5 percent, regardless of similarities and differences in weight of the plies. A spiral ply yarn is made by holding one yarn (the core) under tension while leaving the spiral ply (the wrapper) untensioned and guiding it as it wraps onto the core at an angle of between 45 to 90 degrees. 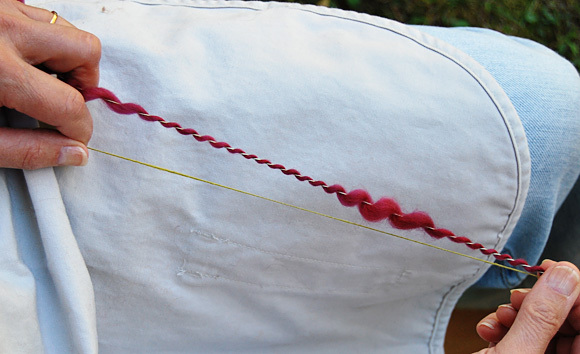 This simple plying method is the basis of spirals, coils, tornadoes and more complex boucles. Before we go on I’m assuming you know how to spin both fine, smooth singles and thick and thin singles, cuz that could be a whole ‘nother article. When you set up to spiral ply, it’s really best to have your two bobbins well placed to start. I like to have my core yarn sitting to my left or in front of me (on the CJkoho Kate 45), and my wrapper to my right (mine is on my Katie A Go Go), since I feed it on with my right hand. I want the core to show, so I ply at less than a 90-degree angle. I hold the wrapper at the thin point with my right hand while rolling the wrapper onto the core because this allows twist to redistribute from thin into thick areas, making a nicely defined spiral. To wind onto the bobbin, I pinch the plied yarn at a thin spot so as not to mess with the twist in the thick spot (such rocket science). To spin a balanced spiral plied yarn like the one shown in Thruway from Lucca Dot Yarns, you need to spin both your core and your wrapper to the right, or Z. Not just that, you need to introduce more twist in both these plies than you would if you were to ply them with equal tension. If you don’t add enough twist to the singles, as you increase the angle of ply, the core single loses more and more twist as it takes more twists per inch to wrap the spiral ply, eventually coming apart. If your singles differ greatly in size (skinny core, fat spiral) like the ones shown here, the fact that the core has more twists to the inch than the wrapper will keep it from coming apart during plying. If the two plies are of relatively equal weights and thicknesses, then you may find you need even more twist in the core yarn. How much twist? I introduced enough twist in my core to make a firm yarn. how much twist in fine singles It’s not overtwisted, but readily tries to ply on itself when slackened. My thick and thin has so much twist that the thin areas are almost but not quite overspun. Twist accumulates in the thin areas of the single, but redistributes into the thicker areas during spiral plying. It all evens out in the end. The bound boucle yarn shown in the other two versions of Thruway is a spiral ply yarn that has been bound with a third ply (the binder) forming a traditional boucle style yarn. It requires one extra step than the balanced spiral ply yarn above. Begin by spinning the core to the left (S). Because you are going to increase the twist in this single during the plying process, you don’t need as much twist as the balanced spiral ply yarn above. 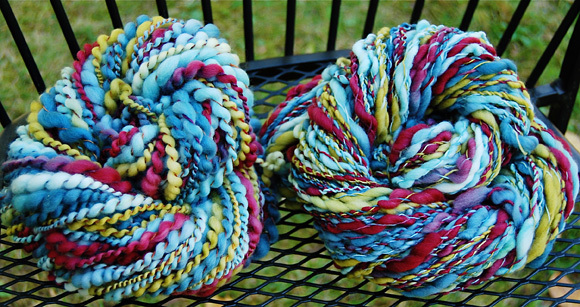 Spin with just enough twist to make a soft yarn. Spin twice the yardage you need, because this singles will be your core AND your binder. Spin the wrapper to the right (Z) with lots of twist as usual. You now have two singles: one to the left, one to the right, one loose and one tight. Spiral ply these two singles to the left as usual. Don’t try to give it the slack test, because it’s going to be pretty squirrelly. Now you are ready to cable to the right. Why don’t I just call it plying? Because cabling requires significantly less twist, just enough to allow the binding yarn to wrap around the spiral plied yarn. The term “cable” you automatically know to take it easy in the twist department. Cable what’s left of the S spun core and the spiral ply yarn to the right (Z) as follows. 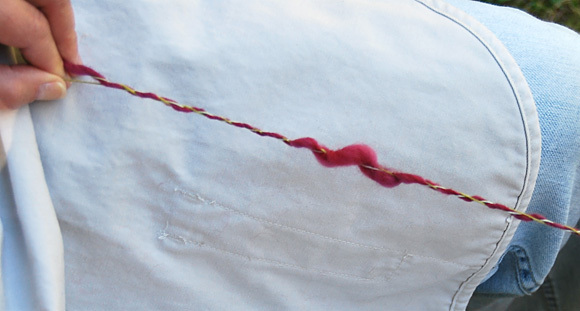 Hold both yarns with equal tension just like a balanced two ply yarn, keeping hold of the point of twist at the orifice. Treadle 2 or three times and allow the twist to enter the yarns (don’t guide it…you'll lose loft and definition). 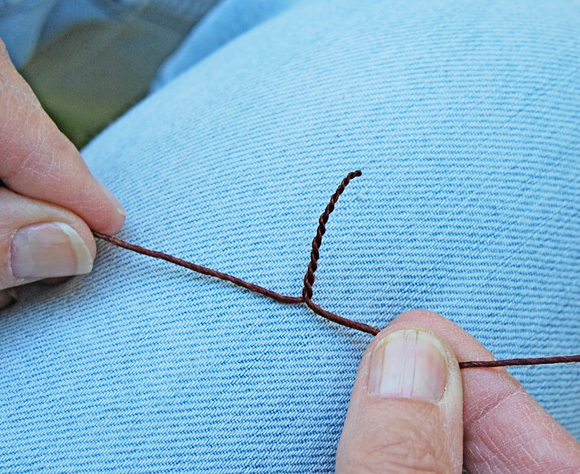 Check for balance by allowing the yarn to go slack. Yarn not slack? If your plied yarn wants to twist back onto itself to the left, it needs less twist in the ply; to the right, it needs more twist in the ply. Grab the yarn where the point of twist has come to rest and wind on. 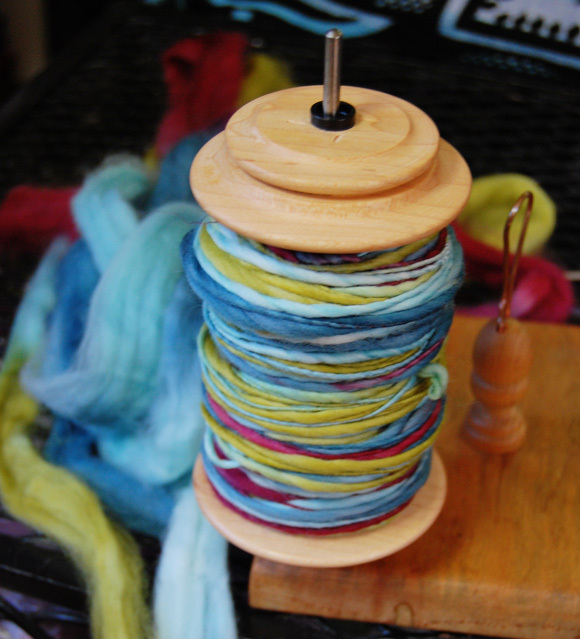 For the spiral ply yarn, spin at a ratio of about 1 to 3 ounces of fiber for core and wrapper. Yardage? You’ll need close to twice the yardage in the wrapper as you have in the core. For the Boucle, spin the same amount of yardage in core/binder and wrapper. Fiber ratio, about 1 -2.5. Gotta love the lazy loops in these balanced yarns (still unwashed). Left, boucle; right, spiral ply. Lynne teaches classes in Foundation Singles for Art Yarns. 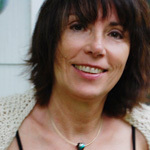 Look for her workshops on her website or on the Twisted Friends group on Ravelry.